PR — Los Angeles, CA — The McClurkin siblings crew up singing together around the house along with five other sisters and brothers, not realizing there was a bigger plan waiting to be unveiled. Andrea McClurkin-Mellini traveled for years singing in the background for her well-known brother, Donnie McClurkin, who’ve had great success as a gospel recording artist and a respected and beloved pastor of Perfecting Faith Church. 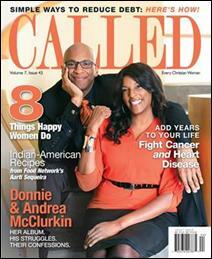 In the recent CALLED Magazine cover story www.calledmagazine.com Donnie and Andrea opens up about life, music and ministry. The family’s ability to be candid about their struggles have become a trademark over the years; but it’s the humor and laughter, laced within the interview that allow readers to get a glimpse of how one can heal emotionally, while growing spiritually. McClurkin-Mellini shares feelings on stepping out as a solo artist for the first time and how the journey has been a walk of faith. “I am overwhelmed and completely humbled by how well the single is doing! I told the Lord from the onset of the project, to take this music where he wants it to go; He has proven faithful and is answering my prayer. I pray it continues to gain the momentum that he orchestrates and prescribes,” says McClurkin-Mellini. The statuesque soprano has a busy first quarter that awaits her as she preps to promote her sizzling single, “God Can” that is close to breaking Top #10 on the gospel charts. The heat is on as she makes her rounds starting with the Be Beautiful Expo in Philadelphia, PA on March 14. On Sunday, March 15 McClurkin- Mellini is set to tape the new online television show, Donnie NEXT, to support her brother’s new venture and her debut solo album, Higher on Camdon Music, as well. The first show will be filmed at B.B. King Bar & Grill located at 237 West 42nd Street in Time Square (212) 997-4144. The show will feature live performances, interviews and an opportunity for audience and viewers to participate in real-time voting during the “Listener’s Choice” segment. The taping is open to the public and tickets are $20/$25 day of show can be purchased at www.bbkingblues.com. Donnie TV will also be expanding to other cities throughout the year. All roads lead to Las Vegas as Who’s Who in Gospel Music prepares to celebrate the 30th Anniversary of The Stellar Awards, Gospel Music’s biggest night. With the hot single paving the way, McClurkin- Mellini s already onboard to sing at key events such as: All White Pre-Awards After Party; promotional performance at the Artist Showcase & Industry Recognition Party; and Pre-Stellar Central South Awards Show for Radio Announcers.